Find some great cropped pants for women such as the Sienna Tomboy Crop Jeans Item # LBW01019 / Style # 7W11059 which are Tomboys for tomgirls. They borrowed their new Sienna Tomboy jeans from the boys, in ripped, torn, faded, frayed denim and a classic, straight fit. There's now a cropped tomboy for every girl. 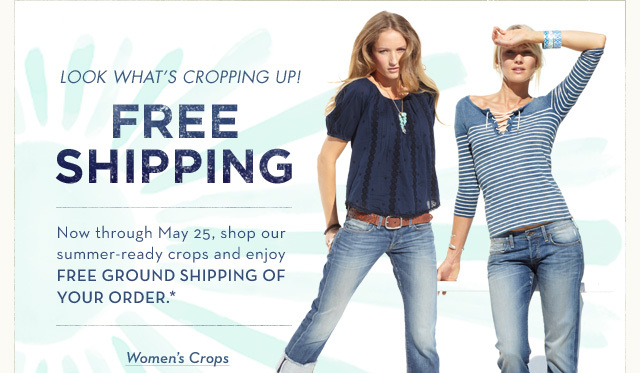 They also have plenty of other crop pants cropping up at Lucky Brand. Learn more about the women's Lucky Brand. Learn more about the Lucky Brand company here on Apparel Search or at the Lucky Brand website.